Members of Holy Trinity are involved in a wide variety of charitable and outreach efforts. As you learn and grow to experience Jesus’s unconditional love for you, you may feel called to be a part of one of these ministries, or bring your own to our church! Read about our Communications and Evangelism. Please contact the church office for more information, and read about our efforts in the community and around the world right here! We do God’s work while supporting our wider community, and friends, members and visitors of the congregation. 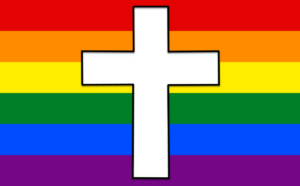 If you would like us to consider your ministry, join us any Sunday and speak to a member of our vestry. Outreach Ministries – Support for our communities and the world! 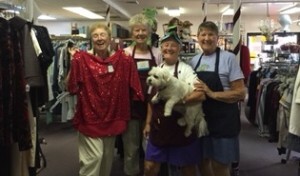 Our Thrift Shop donates funds from the store to support many local charities! We always need volunteers! 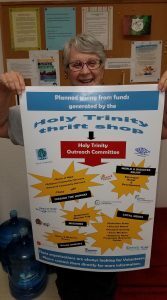 Holy Trinity sponsors free painting classes for the women and regularly donates clean and sanitized undergarments and bedding. We hope to offer cooking classes for the women, too! We also support meal preparation and food collection for RCS. Holy Trinity has teamed with the Humane Society on a joint fundraising effort called “Holy Paws” – an evening of music, entertainment, silent auctions, and delicious food which raised over $17,000 to benefit both organizations! Holy Trinity also partners with the Humane Society for the annual Blessing of the Animals for our furry friends. Holy Trinity co-hosted an HIV/AIDS Awareness Roundtable where social service providers, healthcare providers and a mobile testing unit were deployed to raise awareness and improve the standard of care for those in our community suffering from HIV/AIDS. Email the church for more information. We are looking for someone to enhance our HIV/AIDS ministry. 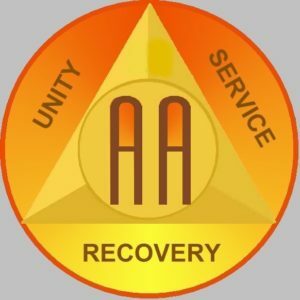 Alcoholics Anonymous – an open Big Book group meets at our church every Wednesday night at 6:30PM and every Sunday night at 6:30PM. ALL are welcome. Struggling? There is HOPE for you! Meals of Hope Every Spring we donate our time for meal-packing events, and our funds to purchase the materials to pack meals. We host a Cabaret musical talent show annually to raise funds for Meals of Hope. Members of our congregation selflessly donate their time, love and support to incarcerated men currently in Zephyrhills Correctional Institute. KAIROS is an ongoing fellowship with persons in prison which begins with a three day short course in Christianity. The course and the ministry is modeled on the Cursillo/Walk To Emmaus format. The mission of the Kairos Prison Ministry is to bring Christ’s love and forgiveness to all incarcerated individuals, their families and those who work with them, and to assist in their transition to becoming a productive citizen in their community. They know that men in prison feel unloved, alone, and most have no friendship with God. Some of us in the free world are already imprisoned by the way we live our lives, but the KAIROS program teaches them that they can be in prison and still be free. Contact the Church Office to learn more about how you can help. Dominican Republic Mission Trip Annually a team from Holy Trinity travels to the Dominican Republic to work on a variety of building projects for the needy in partner communities in the D.R. Read about our upcoming trip! Funds are donated to assist the schools and volunteers also provide their own funds. Details from a prior mission trip here. F.E.A.S.T. Holy Trinity parishioners regularly donate food to the Palm Harbor FEAST food pantry. F.E.A.S.T. provides food for over 3,100 needy people every month in Pinellas Country. Our rector can provide assistance to needy members in the community from funds collected annually for this purpose. These funds are at the sole discretion of the rector. Our church regularly supports HEP through people-support and recently a fundraising partnership called Sip ‘n Savor which raised over $14,000 to help both organizations. Holy Trinity members have long supported Farm Worker Ministries through Christmas Gifts for Children. Every December our congregation’s generosity provides diapers, blankets, and food items for the farm workers. The sub-standard housing many of these workers must endure to harvest the crops we enjoy on our tables is often very cold in the winter months. Providing diapers helps ease financial burdens during the holidays when most of these families are truly strapped for funds. Our efforts usually focus around the Plant City, FL area. Our church donates a portion of our Thrift Shop profits to Episcopal Relief and Development for disaster assistance worldwide. Members of Holy Trinity regularly provide financial support to United Thank Offering. 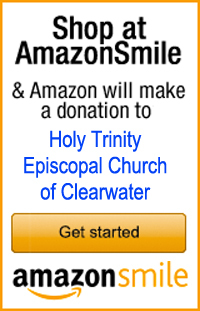 100% of proceeds benefit programs of the Episcopal Church. Annual Picnic and many other opportunities!